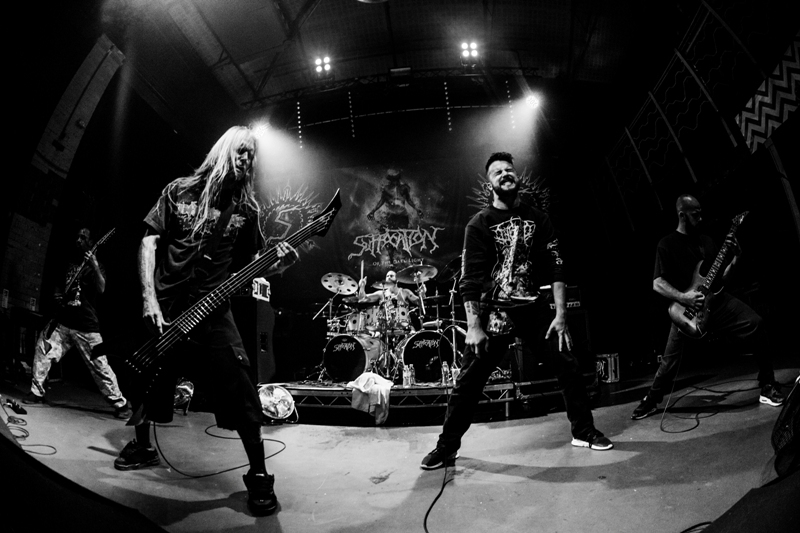 To those attuned to the world of extreme metal, Suffocation need no introduction: having emerged from New York in the late eighties, their blend of intense technicality and bludgeoning breakdowns made them one of the most influential bands in death metal and one that, under the helm of guitarist Terrance Hobbs, remain major players in the field to this day. Openers Erebor are clearly delighted to be sharing a stage with their headliners, with their prog-influenced compositions punctuated by their frontman’s exclamations of joy at being on the bill. It’s a set of a young band, but one with all the chops needed to carry their sound forward. Plague Rider meanwhile strike out in a far more surprising and daring direction: although there’s touches of Cynic to their sound, their chaotic sound – full of intense noise bursts, whiplash tempo shifts and jazzy interludes – makes for an enthralling set whose restlessness stands as a real virtue. Suffocation however know exactly what they’re about. This hour-long headline set is a thing of ruthless efficiency: while new material from their latest album …Of The Dark Lights fits in nicely, they’re more than happy to provide the sharpest, heaviest cuts from their back catalogue in service of bringing their classic death metal sound to Newcastle (and sparking one seriously rowdy circle pit by the front in the process.) A flab-free and suitably imposing performance.